Want to get the most out of Fraser Island? This 2 day, 1 night tag-along tour is for you! Take advantage of the chance to drive on the world's largest sand island! If you're in a bit of a time crunch but still want to experience stunning Fraser Island, the 2-day Nomads Fraser Island Tag-Along Tour is the tour for you! This tour departs from beautiful Noosa Heads and includes 1 night at Eurong Resort on Fraser Island. Driving around the World Heritage-listed island in a 4WD is sure to get your tyres spinning! When you are not revving it up, slow down and admire the beauty around you. This 2-day trip includes a drive around 75 Mile Beach, bush-walking and refreshing swims at Eli Creek, Lake McKenzie, Lake Wabby and much more! All of your meals while you're on the island are included and there are no local fees waiting for you. On top of that, an exclusive post-tour party will be waiting for your group upon return to Noosa at the famous KB's Bar! Experience the best of Fraser Island - book your trip now! 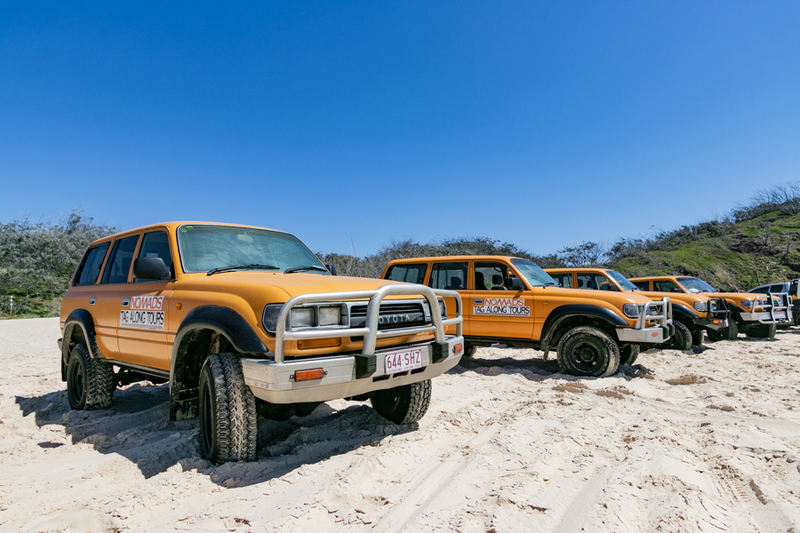 Nomads' tag-along tour allows you to have the option of driving on Fraser Island so you can enjoy the thrill and comfort of making your way around in one of our 4WDs! This unique experience is unlike any other with inland tracks and a sand highway that weaves its way around and across Fraser Island. Your tour will have a convoy of 4WD vehicles, with a lead car at the front, and the following vehicles driven by you - the passengers! Tag-along tours provide a more adventurous experience as you get to navigate your way around Fraser Island, stopping at amazing destinations and sites. You will spend your night at Eurong Beach Resort, where you can relax and enjoy the comforts of the resort after a day of exploring! There are several shops that guests have access to as well as a pool that guests are allowed to use for ultimate relaxation as you socialise with new found friends and travel mates. There are 6-share dorm-style rooms with ensuite bathrooms where you can get a good nights' sleep before the second day of exploring all the beauty of Fraser Island. Eli Creek - Enjoy the tranquillity of this slow-moving clear creek! Lake Wabby - Take a dip in the island's deepest lake! The group departs Noosa by bus at 7:30 am and head towards Rainbow Beach (1.5 to 2 hours drive). Please be waiting for the bus at Nomads reception by 7:30 am. If you miss the bus you will miss the tour. Please ensure you have checked out of your room and have both your Fraser luggage and your main luggage with you. We stop at Rainbow Beach to inspect and collect the vehicles, hand signed rental agreements, pay $250 cash bond and to collect food and we are on our way to the Island. We then take a barge from River Heads and land at Hook Point on the Southern tip of Fraser Island approximately 10 min later. Depending on the weather, and the tide your guide will assess whether it is safe to travel on the beach or if we need to select an alternative route to our next destination, the Southern Lakes. After a relaxing break, it is time for a rainforest track to walk off our lunch and explore the Islands unique flora and hopefully spot some wildlife too! Afterwards, we drive up to Eli Creek and visit the famous Maheno Shipwreck. Drive to Eurong Resort arriving at approximately 5:30pm, have a refreshing shower and then its dinner time (BBQ steak/chicken & salads). Overnight at Eurong Resort, Fraser Island. Another early start to make most of our time on the Island! After breakfast (continental style breakfast - cereal, toasts, spread, tea & coffee) travel to Lake Wabby and Lake McKenzie for a swim and lunch. We depart the Island at approximately 2:30pm, stop at Rainbow Beach to drop off our vehicles, collect bond and drive by bus back to Noosa arriving at around 5:00pm, just in time for the exclusive post-tour party at KB's. Please note guests must attend a pre-tour briefing. You must arrive before 6:00pm the night before departing to attend a compulsory pre-tour briefing held at Nomads KB's Bar where you meet your fellow travellers and learn more about your Fraser Island tour. Safety is paramount and this is when you find out about how the trip will run, driving tips, and nominated drivers will be required to complete required liability and insurance forms. All passengers are required to attend the briefing to be allowed to travel to the Island the next day. Passengers wishing to drive must be a minimum 21 years of age and hold a valid drivers licence (minimum 2 years driving experience necessary). Please be ready at Nomads reception by 7:30 am in the morning of the departure to the Island. If you miss the bus you will miss the tour. Make sure you have checked out of your room and have your luggage with you. This tour may not be suitable if you have an existing neck or back problems or are pregnant. Check with your agent to make sure this tour is suitable for you. Pack a small backpack with your camera, a valid current drivers licence (for those who want to drive), your sunscreen, insect repellent, a hat, appropriate clothing, toiletries, a sleeping bag (also available for hire) and BYO snacks. Please note you cannot bring your own alcohol to the island. Guests are welcome to bring along their own inflatable tubes for Eli Creek as they are not provided. $250 per person fully refundable cash bond to be collected in Rainbow Beach on the way to the Island ( drivers - credit card imprint.) The bond will be fully refunded provided the vehicle has been returned undamaged. Please ensure you have $250 in cash as there is no ATM available at Rainbow Beach. Alternatively you can just pay $10 excess reduction fee (non-refundable). Every passenger must pay this fee, even if they are not driving. This tour only runs from December to April. Itinerary is subject to weather and tidal conditions and may be altered at operator's discretion at any time. Changes permitted up to 72 hours prior departure. Cancellations 72 hours and less prior departure and no-shows will incur 100 % cancellation fee. Itinerary subject to change due to tidal and weather conditions. Tour cancellation less than 72 hours prior departure and no-shows incur 100% cancellation fee . Changes permitted up to 72 hours prior departure. "One of the best trips I’ve done so far in Australia. Our guide Steve was amazing and knew so much about the island, he really made the trip!"